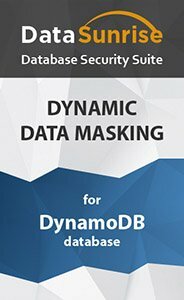 Amazon DynamoDB Data Masking by DataSunrise is designed to protect the database against data leakage. The Amazon DynamoDB Masking component hides sensitive data by replacing values with predetermined signs or values making them unintelligible to any unwanted users. When it is required to have Amazon DynamoDB available to testers, developers, or any third-parties for nonproduction purposes, there is the necessity to restrict an access to sensitive information kept in the database. In accordance with Data Masking rule settings, the Amazon DynamoDB Masking tool intercepts a query directed to the database, modifies it and sends to Amazon DynamoDB making it mask or obfuscate data in the required fields. Thus, unauthorized users have access to the database for particular purposes (quality assurance, application development, analytics and statistics etc. ), whereas do not see confidential information secured in it. Amazon DynamoDB Masking by DataSunrise may be performed either dynamically or statically. Dynamic Amazon DynamoDB Masking obfuscates data on-the-fly and non-privileged users get unclear or masked query result. Static Amazon DynamoDB Masking provides a fully-functioning copy of the database with all confidential data being masked as per preset masking rule settings. It is possible to set notifications of a masking rule being triggered. The Amazon DynamoDB Masking component sends notifications via SMTP or SNMP. Real sensitive data in Amazon DynamoDB always remains intact and only privileged users can access it. Masking rules can be set and flexibly customized to define who has the right to see real values in accordance with the business need. DataSunrise Amazon DynamoDB Masking is a reliable solution to ensure Amazon DynamoDB security of the highest qualityю It also allows an organization to meet privacy standards and regulations.